With the new year on the horizons, Santa Barbara Democrats are looking back on a year of success in the Santa Barbara Mayoral and City Council elections. Beginning this January, Democrats will begin tacking important issues that face our city: Climate change, preserving our social safety net, protecting our environment, and making Santa Barbara a more affordable place to live. 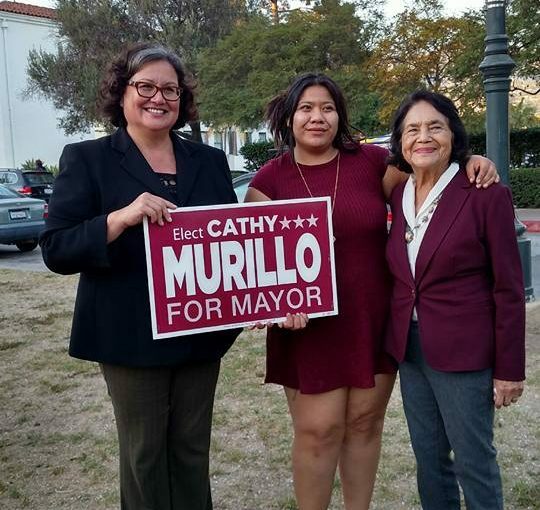 Cathy Murillo has represented Santa Barbara since 2012 where she was the first Latina ever elected to the City Council – she is now the first Latina Mayor in City history. Under Cathy’s leadership on the City Council, Santa Barbara opened a new Children’s Library and increased library hours, updated the Bicycle Master Plan, constructed pedestrian and traffic safety improvements on the Eastside, supported revitalization of the Westside’s neighborhood association, and included environmental protections in the re-commissioned desalination plant. As your Mayor, Cathy will bring vast experience having served Santa Barbara as Mayor Pro-Tem in 2014, and on both the City Council’s Finance Committee (2012 – 2013) and Ordinance Committee (2014 – present). She offers the unique perspective of having represented the City at-large during her first term and then as the Westside District 3 Council Member. Gregg grew up in Santa Barbara attending local schools and graduated from SBCC and UCSB. He was the original manager of Traffic Solutions, promoting local, green and sustainable transportation options to employers, and owned and operated Transitions Preschool, a local small family business for 20 years. In addition to his three terms on the City Council, Gregg serves as Government Relations & Public Information Manager for the Santa Barbara County Association of Governments helping regional efforts to widen the 101 freeway and improve bus and passenger rail service. He deeply cares about the Santa Barbara community, and wants to ensure opportunities for working families while protecting the unique character and environment of the city. Eric has lived in Santa Barbara County since 1980 and attended local public schools, including Monte Vista in the Hope School District. He brings to the Council 14 years of experience as local government staff, having focused on environmental sustainability, as staff to Supervisor Carbajal on President Obama’s State Local and Tribal Leaders Climate Task Force, the 2013 Countywide Poverty Study, and the 10 Year Plan to End Homelessness. His experience will bring a long-term perspective to the council, and make him a dedicated representative for the 5th District and the City at large. Kristen Sneddon is a Santa Barbara local and 25 year resident. She graduated from Santa Barbara High School in 1989, not long after the last stop sign was removed from the 101, and before Paseo Nuevo made its debut. She teaches Environmental Geology at Santa Barbara City College, has opened a small business, and served six years as an executive officer on the Governing Board of Peabody Charter School (where she is current Chair). Through her experiences as an education leader, Kristen has developed a deep appreciation for the city’s strengths, and cares about preserving the character of our city, while contributing to our legacy of environmental leadership.